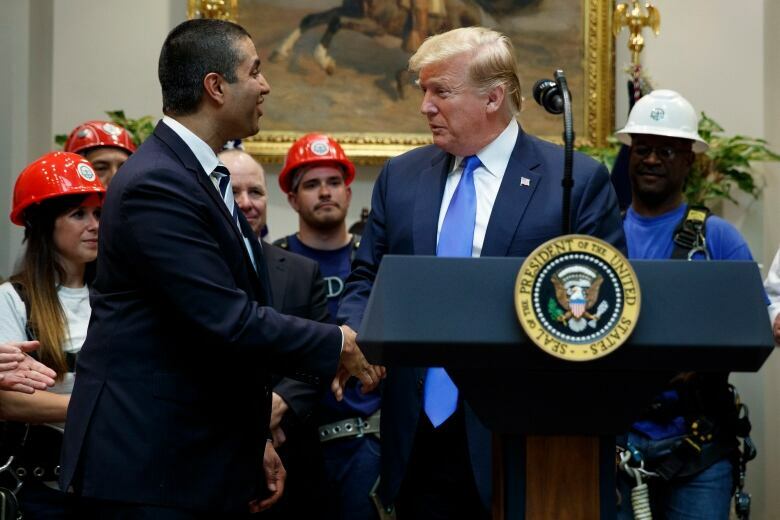 Trump also announced a $20-billion plan to expand broadband access to rural areas currently without it, a decade-long extension of an existing program. A 5G network expansion will mean faster wireless speeds and has implications for technologies like self-driving cars and augmented reality. Trump said it will transform the way people work, learn, communicate and travel, making farms more productive, manufacturers more competitive and health care better and more accessible. But experts say it’s hard to know now how much life will actually change because of the much-hyped network upgrade. The U.S. is jockeying for a position with China over 5G. It has effectively banned Chinese telecom equipment maker Huawei from most U.S. networks due to concerns that it might enable Chinese government spying, which Huawei denies. The U.S. has pushed its allies to do the same, with mixed results . Huawei is the world’s largest maker of such equipment. The FCC also said Friday that it will be renewing an existing $2-billion broadband subsidy program, for 10 years. It will provide about $20.4 billion over a decade to providers, with the goal of connecting up to 4 million rural homes and small businesses to high-speed internet.